Keep your hands safer with the Carbon Claw Aero AX-5 neoprene gel hand wraps. The neoprene wraps have extra-thick protection for the knuckles and a 1.3m cotton wrist strap which provides great support for this area. Designed to fit comfortably inside boxing gloves, these hand wraps have on open palm for better breathability and a Velcro closure to keep them secured and in place. for submitting product information about Carbon Claw Aero AX-5 Neoprene Gel Hand Wraps We aim to answer all questions within 2-3 days. for submitting product information about Carbon Claw Aero AX-5 Neoprene Gel Hand Wraps. We aim to answer all questions within 2-3 days. If you provided your name and email address, we will email you as soon as the answer is published. 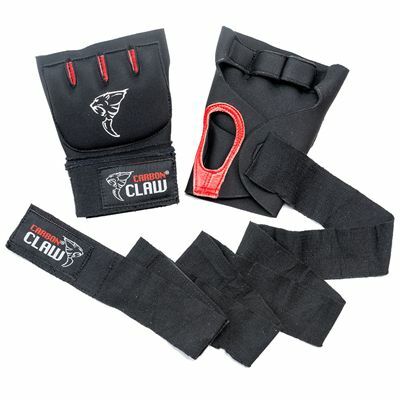 for submitting product review about Carbon Claw Aero AX-5 Neoprene Gel Hand Wraps.